Do you fancy hob-nobbing with the stars? Madame Tussauds in London – the original and best – first opened in 1835, and it still stands today as the best place in London to star spot. 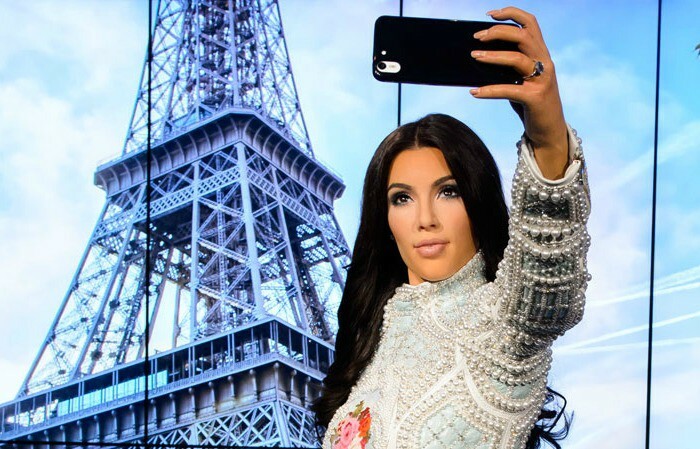 All your favourite movie stars, musicians, sports stars and world leaders are under one roof at Madame Tussauds, as well as great figures from history and old wax figures created by the lady herself. 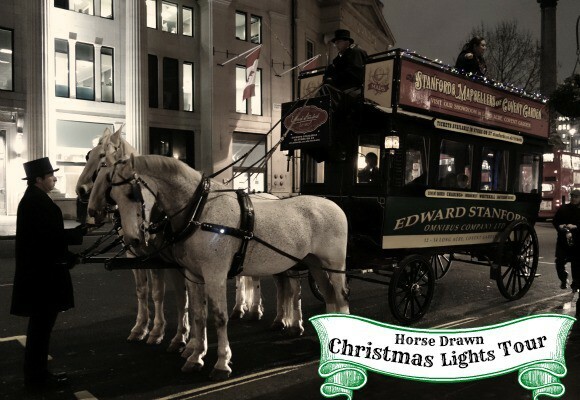 With so much to see, we’ve counted the top 10 things to see, so you don’t miss a thing! 1. 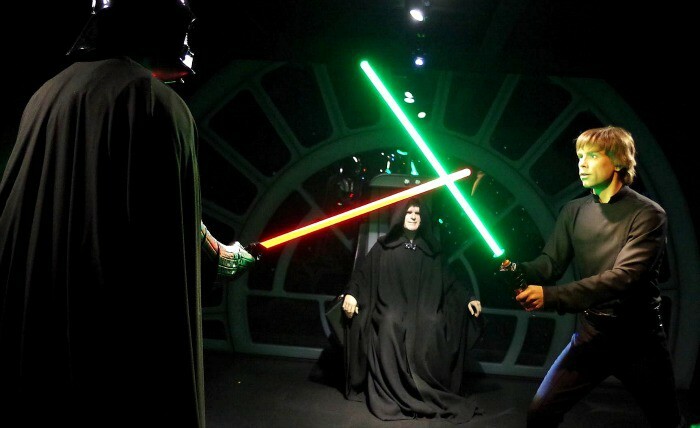 Star Wars – Perhaps the most exciting exhibit currently at Madame Tussauds London, the Star Wars Experience showcases classic scenes and characters from the movies. As hype builds for the new movie ‘The Force Awakens’, now is the time to visit and remind yourself why the world loves this incredible movie franchise so much. 2. James Bond – With the release of the latest James Bond movie ‘Spectre’ imminent, take a trip down memory lane with this special display of all six James Bonds. Displayed until the end of November, the wax Bonds embark on a worldwide tour in December 2015, so catch them in London while you still can! 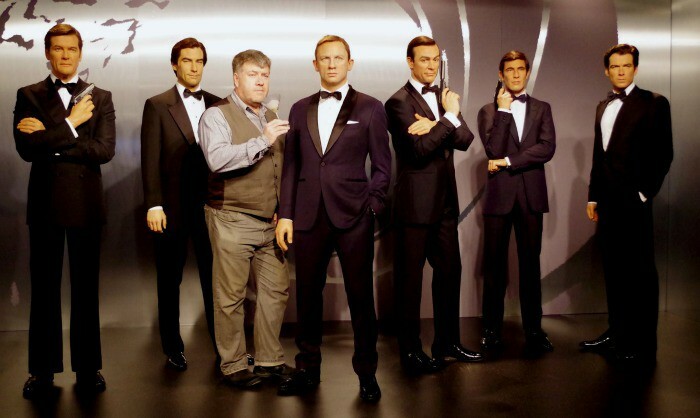 Team mate Keith poses with the Bonds – can you spot him? 3. 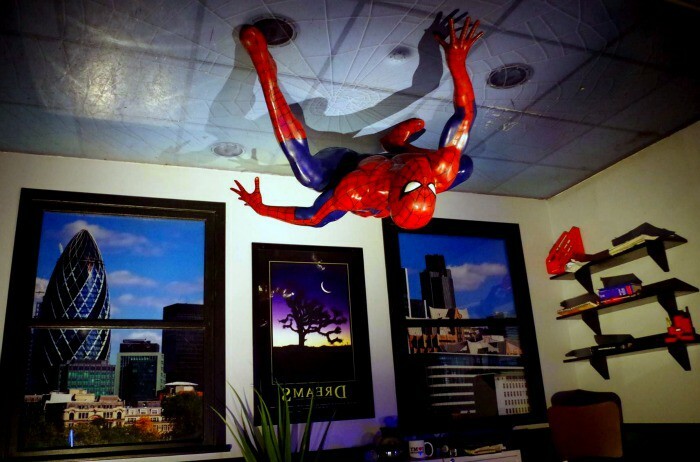 Marvel Super Heroes 4D Experience – Meet the heroes from the Marvel films with this superb exhibit. See Spiderman, Wolverine, The Incredible Hulk and so much more, as well as an exhilarating 4D section that will have all your Spidey senses tingling! 4. Zalfie – Have you heard of Zalfie? The brand new YouTube section of Madame Tussauds focuses on two of UK’s most successful stars of YouTube. Zoe Sugg and Alfie Deyes are part of a new type of celebrity movement that originated entirely on the global video sharing site. Their YouTube channels have a combined viewership of about 14 million, so if you don’t recognise them, you might want to remember their faces! 5. 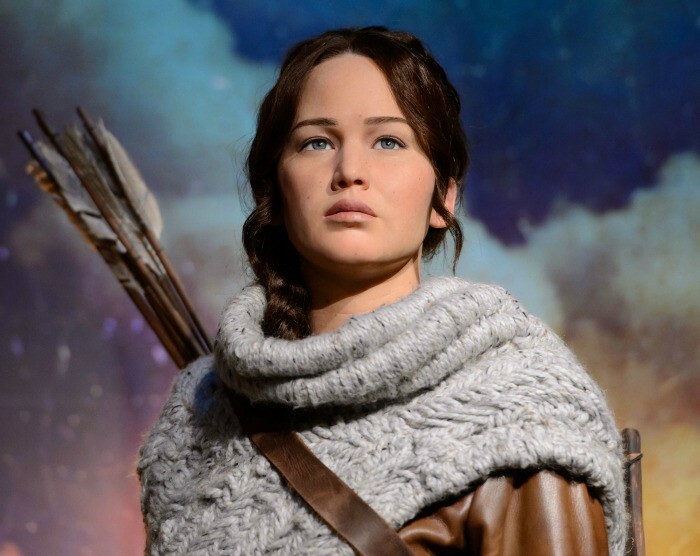 Katniss Everdeen – Another star from an successful movie franchise, you don’t want to miss Katniss from The Hunger Games, especially as Mockingjay Part 2 is due to come out in November! Pose for a picture beside her and join the revolution to liberate Panem! 6. The Royals – No visit to London would be complete without some sort of Royal activity. Madame Tussauds has figures of the Duchess of Cambridge, Prince William, Prince Harry and, of course, the Queen herself – who has been the subject of no less than 22 Madame Tussauds wax figures showing her at various points in her lifetime! 7. Benedict Cumberbatch – Star of Sherlock (another UK legend) and global heart throb, the incredibly lifelike wax figure of Benedict Cumberbatch is not to be missed. 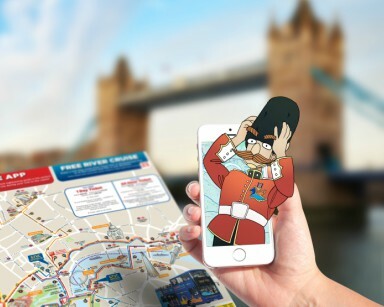 Why not skip on over to the Sherlock Holmes Museum after you visit Madame Tussauds? After all they are only 4 mins walk apart! 8. Kimye – Get a selfie with the most famous super-couple in the world, Kim Kardashian and Kanye West. As Kim raises her phone to the perfect selfie angle, Kanye hovers in the background – it’s ideal for a surreal instagram shot! 9. Death Masks – Madame Tussaud herself had a very interesting life; she was involved in the French Revolution and was almost executed by guillotine! After she was released, she was employed to make death masks of the victims of the movement, including Louis XVI and Marie Antoinette. The death masks became a symbol for the revolution and can be seen in the museum today. 10. Madame Tussaud – In 1842, eight years before she died, Madame Tussaud created a self-portrait wax model which still stands today in the museum. Make sure you spot the unassuming figure of a little 80 year old woman, without whom none of the rest would be possible! 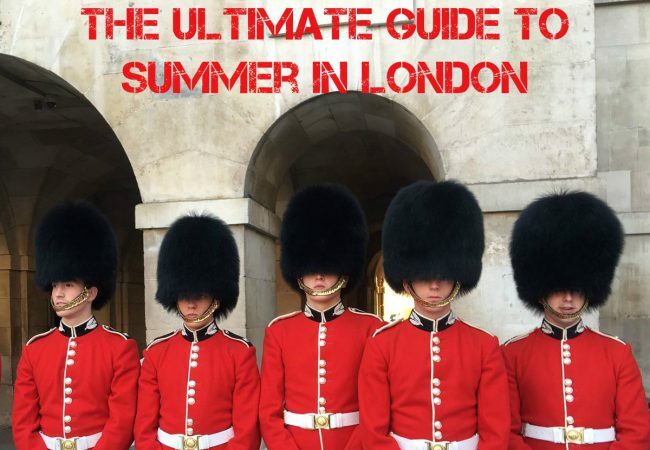 The popularity of Madame Tussauds means it’s better to book before you go. Who would you like to see at Madame Tussauds? Images from Merlin and EHL Photography.